Based on the proven Heartbreaker x Darco cross, we are excited to see the results of this pairing next spring. Azemieka has already produced two fillies that have gone on to earn their ster/keur predicates ... Perhaps this foal will be the one to earn her the preferent predicate!?! 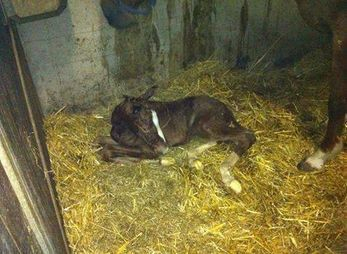 Born: March 30, 2014 - It's a FILLY!! I am so very proud to introduce "JADZIAMIEKA"!! The video below shows Jadzia for the first time in the paddock just a few hours old. I am so incredibly happy with this little foal!! How little Jadzia has grown and developed in just a few short months!! Independent and powerful in her movement, I'm certainly going to enjoy seeing how this one develops!! A weanling now, Jadzia enjoys running with the other fillies - and is pretty light and quick on her feet!! Jadziamieka is now in from the fields. Unfortunately she is rather small at the moment (measuring just under 1.58m), so we are not sure if we will actually be sending her to her studbook inspection this year.